Arlington, VA (October 15, 2018) —Today, National Cooperative Bank, known for providing banking solutions tailored to meet the needs of cooperatives and their members nationwide, released its annual NCB Co-op 100®, listing the nation’s top 100 revenue-earning cooperative businesses. In 2017, these businesses posted revenue totaling approximately $214.4 billion. 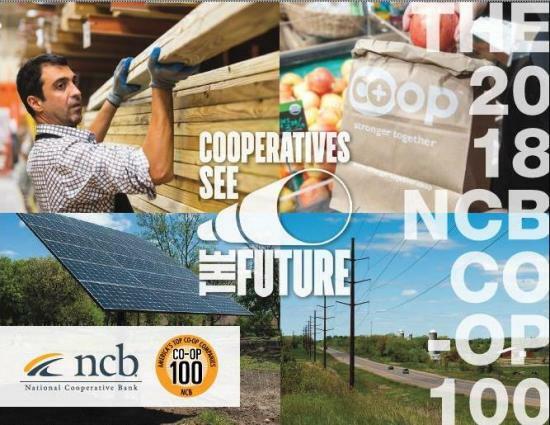 The NCB Co-op 100® remains the only annual report of its kind to track the profits and successes of cooperative businesses in the United States. This year’s theme for Co-op Month is “Cooperatives See the Future.” In addition to ranking the top 100 co-ops by revenue, the report also highlights how co-ops see their future-to better serve their members and the community. CHS Inc., based in Inver Grove Heights, Minnesota reported $31.9 billion in revenues in 2017 and maintained its first place position on the NCB Co-op 100® list. Dairy Farmers of America, based in Kansas City, Missouri, reported $14.7 billion in revenues, earning the number two ranking this year. Wakefern Food Corporation/ Shoprite, based in Keasbey, New Jersey reported $12.9 billion in revenue, earning the fourth ranking this year. Associated Wholesale Grocers, Inc., based in Kansas City, Kansas reported revenue of $9.7 billion and earned the fifth position on the list. ACE Hardware Corp., based in Oak Brook, Illinois earned $5.4 billion in revenue and came in at number nine on the list. Do-it-Best Corp., located in Fort Wayne, Indiana earned the 13th place on the list, with $3.2 billion reported in revenue. Navy Federal Credit Union, headquartered in Merrifield, Virginia, earned $6.0 billion in revenues and is number eight on the list. CoBank, headquartered in Greenwood Village, Colorado earned $3.3 billion and came in 11th on the list. HealthPartners Inc., located in Bloomington, Minnesota earned $6.6 billion in revenue and is seventh on the list. Basin Electric Power Cooperative, located in Bismarck, North Dakota earned the 15th position with a reported $2.3 billion in revenue in 2017. Oglethorpe Power Corporation, located in Tucker, Georgia earned the 29th position with reported revenue of $1.4 billion in 2017. As a long-time advocate for cooperatives, NCB’s mission is providing critical financing to support the growth and expansion of cooperative businesses, while also deploying hundreds of millions of dollars to support underserved communities and cooperative expansion initiatives. Although similar to other business models, a cooperative has several unique features. It is owned and controlled by its members, who have joined together to use the cooperative’s goods, services and facilities. A board of directors, elected by the membership, sets the cooperative’s policies and procedures. By pooling resources, members can leverage their shared power to buy, sell, market, or bargain as one group, achieving economies of scale and sharing in any profits generated. In addition, communities benefit both socially and fiscally by the cooperatives’ ability to access and deliver goods and services from across the nation.